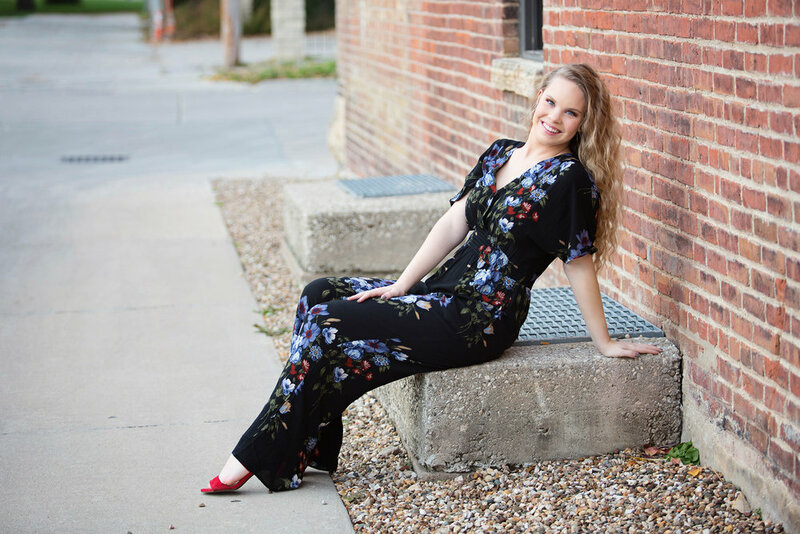 Olivia’s October senior portrait session couldn’t have been a more beautiful day. Her mom and I had so many ideas, and Olivia’s only request was that we make a stop at Almost Famous Popcorn Company in Newbo and she wanted colorful trees. 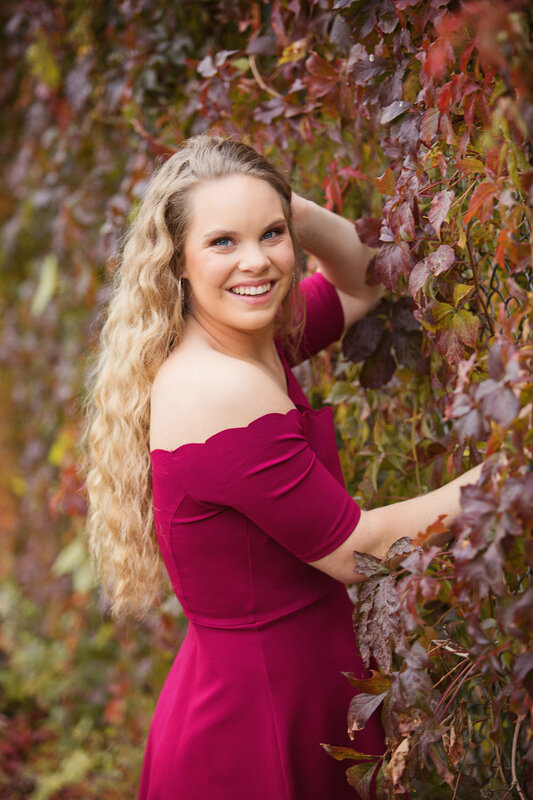 About a week before her senior session date, most of the trees lost all of their colorful leaves, and although I know I can create some Photoshop magic and fall color if needed, I still aim to please! As I was driving around, scoping out areas hoping to find ANY colorful foliage left, I came across a giant patch of my favorite tall, plume-y grass that occurs in the fall here in Iowa, pampas grass. I hadn’t gotten to photograph it ALL year and knew I HAD to try it with Olivia. The location wasn’t ideal, it was in the middle of a very public area, but I thought with some creative angling it could possibly block out the busy, bustling background scenery. So that’s where we started, and although it was a challenge to get into the middle of the crazy, deep grass, it was totally worth it! As requested by Olivia, we popped (pun-intended!) into the cute little Almost Famous Popcorn Company shop for a mini photoshoot with their popcorn. With their vintage sodas and vibe, I knew the red dress that Olivia had brought would fit the decor well. We made this part fun and quick, I didn’t want to be too disruptive - but the employees were so nice about letting us use their space! 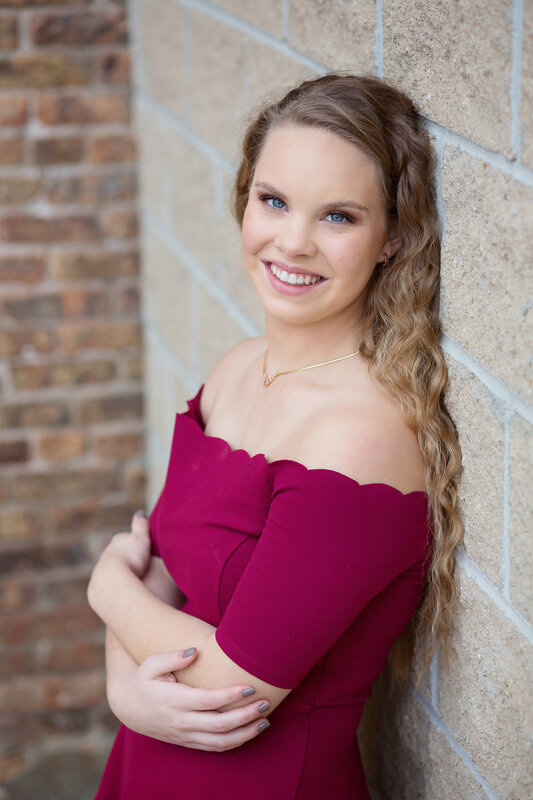 We walked around looking for some more amazing spots (stopping to pet some adorable dogs along the way) and took some classic senior portraits with Olivia’s grandma’s necklace she had brought for her session (as a surprise for her dad!) And yeah, when you have hair like that, you better believe you’ll spend 50% of your session doing hair flips! As the sun started to get lower in the sky, it was time to head out for our last portion of Olivia’s senior pictures. We headed out Squaw Creek Park in Marion, which is usually FULL of photographers this time of year (because it’s an amazing park, obviously) but there was nobody there! (Maybe because all the leaves had already dropped?!) So we set up camp - sort of literally! LOL. I bring a pop-up changing tent for sessions so you don’t have to get changed in the backseat of your car. It’s pretty awesome. I pulled out my vintage-floral “grandma” chair and it matched Olivia’s romper perfectly! The sun was setting extra quick it seemed, but oooh man, look at that gorgeous golden glow that I LOVE! And I seriously loved this location!! I wanted to photograph Olivia here forever! She ROCKED her session - aren’t her outfits so adorable?! Senior pictures are SO fun, and we party until there’s no more sun left in the sky. Olivia’s session was no exception. We did one last outfit change for a more comfy/casual look and finished up her session. We even found a tiny patch of flowers that I insisted she lay in, which happened to be her mom’s FAVORITE photo of her! A little behind the scenes, courtesy of Olivia’s mom! Thanks, Karen! I LOVED every minute of Olivia’s senior portraits and her images are some of my all-time favorite senior pictures. We had Olivia’s ordering session, a few tears were shed, and her family decided they’d love a photobook of her photos. I designed her photobook using all of their favorite images, and they had me design a custom cover for it as well, and I just LOVE how it turned out!! Its too cute not to share; isn’t it gorgeous! ?